Credit: Juliet McMullin, UC Riverside. RIVERSIDE, Calif. – Juliet McMullin, an associate professor of clinical sciences in the School of Medicine at the University of California, Riverside, has received a grant of $250,000 from the Patient Centered Outcomes Research Institute (PCORI) to lay the groundwork for providers and Native American patients in the Riverside-San Bernardino, Calif., area to address patient well-being and chronic health concerns. According to the U.S. Department of Health and Human Services, Native Americans have long experienced lower health status when compared with other Americans. Diseases of the heart, malignant neoplasm, unintentional injuries, and diabetes are leading causes of death among Native Americans. There are many factors such as policy, access to and delivery of care, and cultural differences that may contribute to such poor health outcomes and need to be examined. "UC Riverside has a long history of engagement with Native American communities," said McMullin, the principal investigator of the 20-month grant and the associate director for community engagement in the UCR Center for Healthy Communities. "The campus is home to a strong Native American Student Association that has hosted the Annual Medicine Ways conference for over 34 years. As a new School of Medicine and Center for Healthy Communities, our mission is to serve the communities of inland Southern California. It is time to collaboratively increase trust, and do the work that addresses the health needs of all of inland Southern California's Native Americans." The research project is called "Chihuum Piiuywmk Inach," a Serrano phrase that translates to "A Gathering of Good Minds." The name was given to the project by a respected elder from the Morongo Band of Cahuilla Mission Indians. The UCR Center for Healthy Communities and Riverside/San Bernardino County Indian Health Inc. (RSBCIHI) are the primary partners for the PCORI Engagement Award. The Gathering of Good Minds: Engaging Native Americans in Wellness project aims at increasing the capacity of community partners to collaborate in research. Efforts are already being directed at sharing and understanding concerns around health inequalities, chronic illnesses, and the role of intergenerational care in the Native American community. Community partners and UCR faculty and students will partner in doing community-engaged research. "We will use an approach that equitably involves all partners in the training process for developing, designing, and implementing research questions that are relevant to their lives," McMullin said. "In doing so, we recognize the unique strengths that each member brings to our gathering." 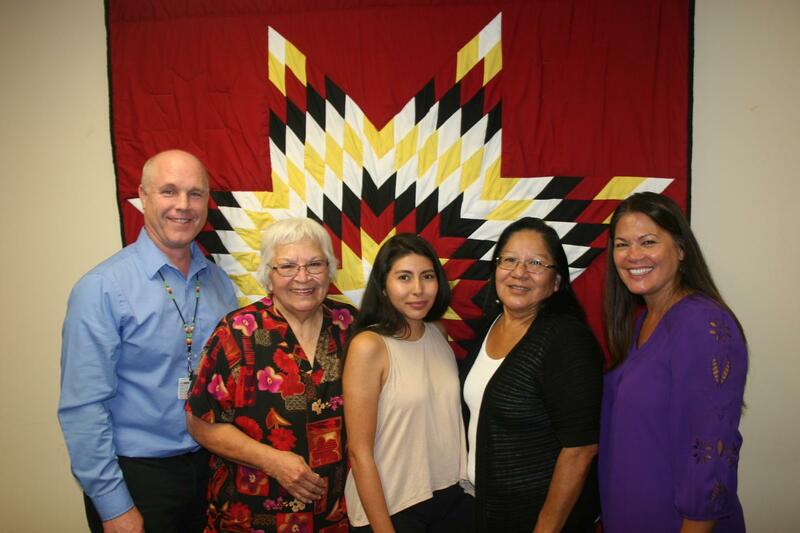 Other members of the project team are: Kendall Shumway, who has worked for 13 years with RSBCIHI on Indian health; Luella Vann Thornton, a health educator; Sherri Salgado, a member of the Cahuilla Band of Indians and a RSBCIHI Executive Board Member; and Jessica Hernandez. More information about the team members and the Gathering of Good Minds: Engaging Native Americans in Wellness project can be found here. The PCORI Engagement Award, which funds the project through February 2018, will also support regular fellowship meetings, community forums, and a wellness summit. The first fellowship meeting took place on Oct. 6. "Historical trauma and its relationship to health framed the conversation at our talking circles," McMullin said. She noted that monthly fellowship meetings will be hosted for six months at the San Manuel Band of Mission Indians, Grand Terrace Clinic; at the conclusion of the first series, a second series of meetings will be held at the Morongo Clinic in Banning. McMullin is a cultural and medical anthropologist. She joined the Center for Healthy Communities in 2014. Her research interests include the political economy of health and the role of narrative in medical encounters. She has focused specifically on topics related to medical knowledge and inequalities in cancer, cultural meanings of health, and pediatric injury. McMullin has worked extensively with underserved populations, including Latinos, Pacific Islanders, and native Hawaiians living in Hawaii and California.